Also known as false teeth, dentures are often dismissed as being old-fashioned, of little value and something to be avoided at any price. 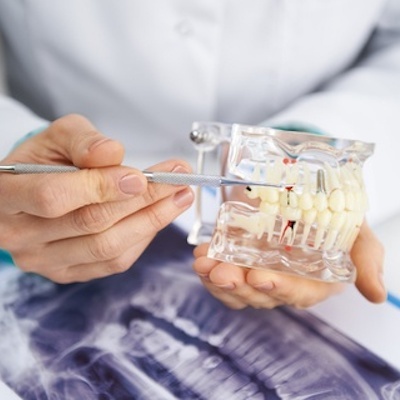 Admittedly dentures do have a bit of history behind them, as discoveries of ancient Egyptian constructions of ivory, wood and gold prove, but modern dentures can return a smile to its youthful glory. Unobtrusive, easily tolerated and good value for money, dentures are quite often the best way to achieve good aesthetics, as we can replace not only missing teeth but also the missing gum tissue which can be a real problem in the smile – line. We not only match the shade of the natural teeth, we can also obtain very realistic gum shading, even when pigmentation is visible. There are many different indications for the use of a denture, from the simplest emergency replacement of a single tooth to complicated implant – retained constructions on 2 or 4 implants, costing less than half the price of a fixed ceramic bridge. Important in good denture fitting is communication; at the try-in stage, you are able to decide on the shape, size and colour of your teeth, guided by the dentist. You must also feel comfortable returning for any minor adjustments which might be necessary after the fitting, no matter how small.